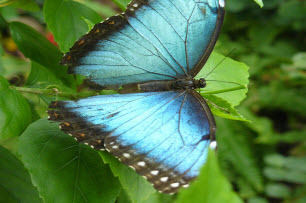 Key West Butterfly Conservatory Is Just Like Avatar Without The Need For 3D Glasses! 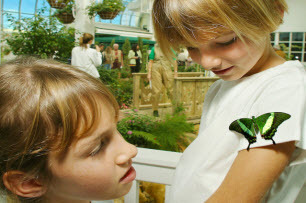 Fancy going to the Key West Butterfly Conservatory? Well you will be in for quite a surprise, as many people will give this one a miss as they don’t feel there is much to it. Think Avatar without the stupid 3D glasses and you’ll get an idea what to expect at this Key West Attraction. From the moment you step through the door and into this conservatory you enter an enchanted world of beautiful foliage, flowers, birds and butterflies fluttering all around you. Although even though you will be keen to get straight into the main attraction, make sure you stop and watch the Pre-entrance video which is really informative and teaches you a lot about the life of the butterflies. I have to be honest I had a kind of pre-school knowledge about it all which wasn’t too far from the truth, but did add extra bits and bobs to my knowledge base and helped me make the most of my time there. 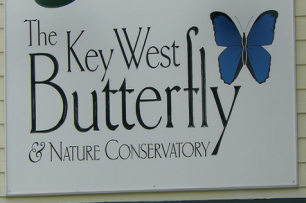 When we visited the Key West Butterfly Conservatory we took three children with us, aged 2, 4 and 10 and they loved it (well two them loved it, as the little one freaked out when the huge butterflies landed on her). They do really come close and to be able to see something this beautiful and delicate sitting proudly on your arm really gives you a sense of wonder that we are doing a lot of damage to the truly beautiful world that we live in. Sorry…..got a little bit preachy there for a moment. As you walk through the gardens, you can see that a huge amount of love has been put into creating the world that these beautiful butterflies live in. There are streams and waterfalls mixed in with the flowers and foliage throughout the Key West Butterfly Conservatory, and added to the lovely floating music it really gives you a sense of peace away from the hustle and bustle of Key West. The kids also loved the small quails that run about the place, and you do have to keep your wits about you, as they have a habit of running across the paths as you walk gazing up at what is going on around your heads. If we were going to be really critical then it would be to do with the heat in side of the Conservatory. These little butterflies must need to be kept warm but do they need to be kept that warm???? Look out for the large cooling tubes that you can find around the garden and stand in front of them for a few minutes. It will make things a lot more comfortable and is quite refreshing against the heat inside the conservatory. Even the gift shop has butterflies in it so you see more and more as you walk through to the exit, and the quality of goods and souvenirs is very good indeed if you fancy taking something a little bit special home from your trip to Key West. There is free parking located behind the butterfly building and they honor AAA discount as well as coupons that can be found in various tourist guides found around town. Overall, the entrance fee for the attractions is well worth it, and the whole place is a great way to spend an hour or so in Key West.